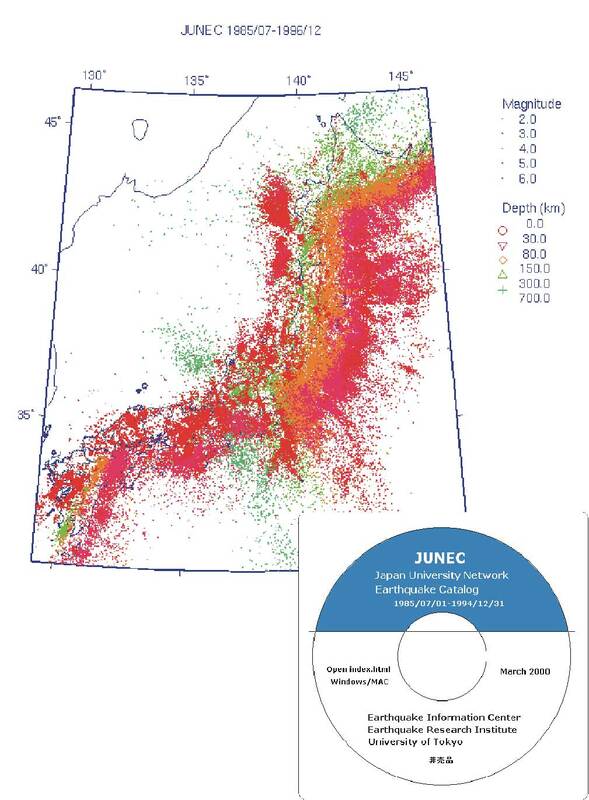 Earthquake Information Center (EIC) has a central role of Japan University Network for the Earthquake Prediction Program, making archives of all seismic data observed in Japan. EIC also creates a database and develops software to analyze the database. To utilize this database, EIC coordinates various collaborative projects among domestic and international researchers, concerning the source process of earthquakes and tsunamis, real-time seismology, and the communication system for earthquake information. 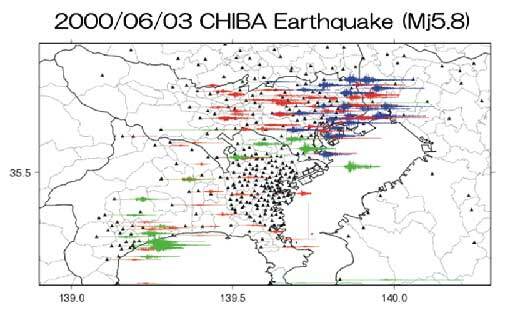 The data obtained from the observation networks of the earthquake prediction information have been combined for alignment by the newly inaugurated Japan University Network Earthquake catalogue (JUNEC). The data are made available by CD-ROM since 1999 (Fig.1). Fig.1. Distribution of earthquakes determined by JUNEC(1985-1996) and CD-ROM. EIC has been engaged in developing access systems for a waveform database to provide every researcher with the seismic waveform database via the Internet. Using this system, data gathered by the center are publicized as new J-array seismic waveform data, and are available via the WWW (Fig. 2). Taking account of the fact that a satellite telemetry system started operation to make data available to every researcher, all of the new J-array waveform data have been compiled in EIC since March 1998. Fig.2. 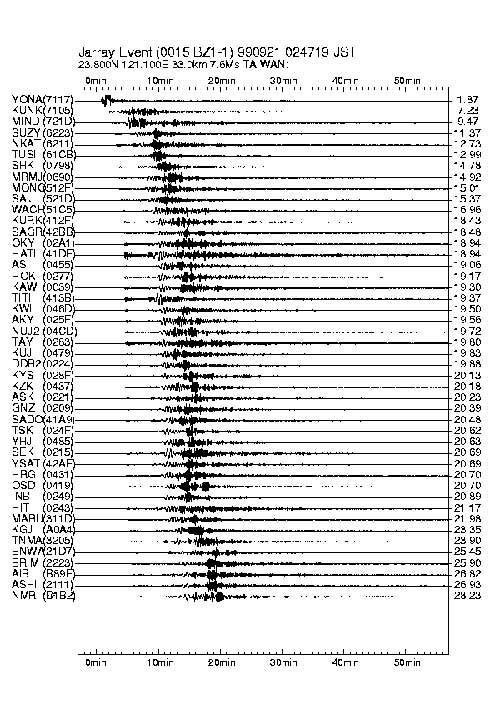 J-array broadband waveform data of the 1999 Taiwan earthquake. Parallel computer SGI Origin 2000 System that consists of 64 CPU's was introduced in March 1999. The capacity is drastically improved by this system, and it is possible to calculate the large-scale simulation. 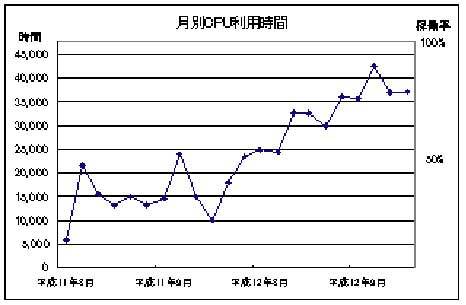 Now the CPU working rate in the monthly is daily utilized to the limit to the capacity with 80-90% (Fig. 3). It is required urgently to increase the capacity. Fig.3. The users CPU time of the parallel computer. To support smooth notification of the users of the center, the EIC newsletter has been published almost once per two months since December 1997. Edition No.20 was issued in January 2001. The edition contains information concerning usable resources such as software and database, users' activity, and seismological information. Quick information about earthquake source and strong ground motion is obtained by analyzing quasi real-time seismic data, which can support a prompt emergency response to mitigate earthquake hazards. For large and damage earthquakes or volcanic eruption, our analytical results have been published on Special HP (Fig. 4). CMT solutions ("ERI Auto CMT solutions") by automatically using waveform data from IRIS-DMC are also published on Special HP. For interesting earthquakes such as those with the magnitude greater than seven or those believed to be important regardless of their magnitude, the rupture process of the earthquake source is analyzed using teleseismic body waves. The results are edited for publication with the title "EIC Seismological Note". Fig.4. 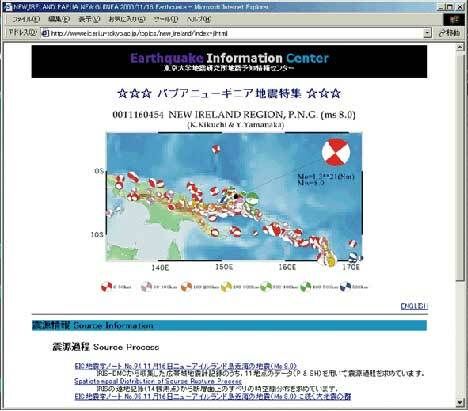 Special Event Page (Nov.16, 2000 Papua New Guinea Earthquake). After the 1995 Kobe Earthquake, local governments installed strong motion seismometers and seismic intensity meters in metropolitan area. EIC constructed the system "Seismic Kanto Strong Motion Network" which collects these strong motion waveform data by getting cooperation with local governments. The network covers a wide area (the Kanto area) with high density (450 observation stations) (Fig. 5). Fig.5. Seismic Kanto Strong Motion Network. EIC preserves many historical seismograms recorded at Hongo, Tokyo, from 1899 to 1942. The preserved seismograms reach the 200,000 sheets. 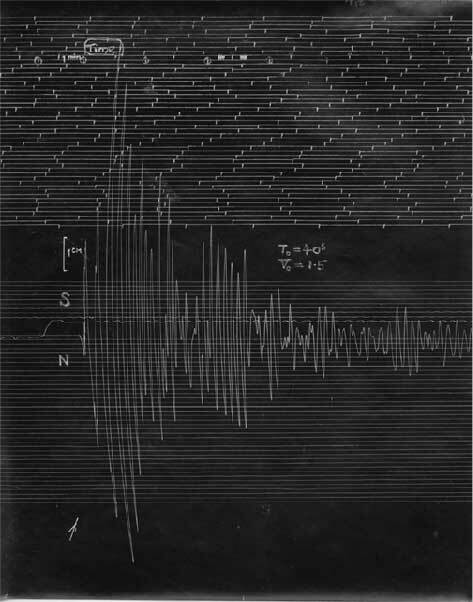 The seismograms were copied on microfilms. Database retrieval system of these seismograms has also been constructed. EIC also preserves records of the World-Wide Standardized Seismograph Network (WWSSN) from 1978 to 1988 in the form of 35mm films and microfiches. In addition, many old seismological bulletins such as the International Seismological Center and other foreign observatories, are maintained by the Earthquake Information Center and the Earthquake Prediction Research Center. Fig.6. Northern Izu Earthquake of Nov. 26,1930 recorded at Hongo, Tokyo.